Welcome back to MIIS Radio! The fall semester is underway and we at the DLC are proud and excited to welcome you back with reinvigorated spirit. For returning students, the DLC has undergone some interesting new changes, and for new students, the DLC welcomes you into the family. Our work is housed at the intersections of education and technology, so if you find that you need help with your content, competency, or presentation we can provide you free consultation services. To keep the words brief and the speech flowing, please click on the link to be (re)introduced to some key communication tools, resources, and event updates. 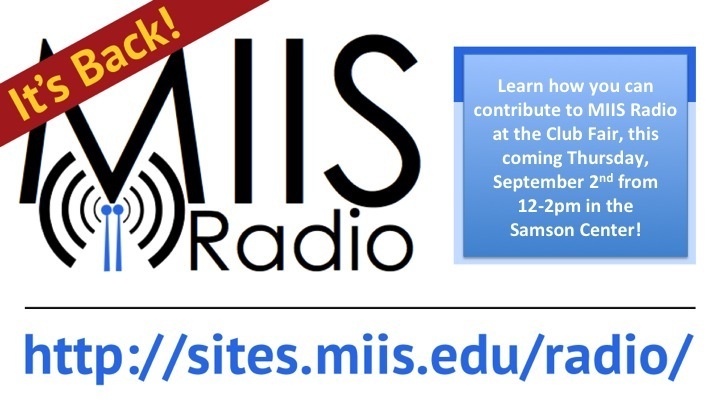 This year MIIS Radio will become an official student led organization, so come check out our booth on Thursday from 12-2 in the Samson Center! We want to hear your voice. And we want you to be heard. Let’s make it happen together!